It’s our last full day in Berlin – and there is a ton of things still on our list to see and do. Unfortunately – one of them is Laundry. Can’t get away from the fact that eventually either you wash clothes or people start to move away from you in the Metro. Which, on consideration – might not be the worst idea. Anyway – laundry. While it’s awesome that the Cat’s PJ’s has machines – and they aren’t $$ (just 4 euro’s for the load – wash and dry) – they are slow. Really slow. So it’s a relaxing morning – I get some blogging done, The Intrepid Traveler reads – and eventually the laundry is hanging in our room. We just couldn’t wait for the dryer to dry everything completely. It’s almost lunch time before we leave the hostel – and our first stop is the Karstat Department store. It’s right across the street from the hostel – and it’s huge. And amazing. I love the houseware department – German and Italian plastic ware are so cool. There’s the complete selection of all the top designers – and we spend a good 30 minutes just handling all the beautiful things. Eventually – big shoppers that we are – we pick out a 1 euro knife to have on hand for cutting fruit. Then it’s on to the Museum of European Cluture. Never heard of it? Not a surprise! It’s not really a museum – it’s 4 rooms in a larger museum dedicated to Ethnocology – and there’s a gigantic exhibit on Canadian First Nations! We quickly walk thru – admiring their considerable collection – and thinking – what must the Germans think of Canada – Land of Indians? Do they think we still have cowboys? Oh well – I guess our efforts at explaining the issues related to East and West Germany are probably even less informative. The display related to European Culture is fairly interesting – lots of stuff I really didn’t know – including the fact that Doner’s were invented in Berlin. Yes – Doner. Those omnipresent huge meat things that stand vertically in a rotisserie in Turkish Fast Food restaurants. Who knew it was a Turk living in Berlin who invented that? I have to say they have been yummy eating here. There is also a very interesting exhibit on WWI – everything is made of grey felt and chicken wire – definitely inspires respect and remorse in the heads of the viewer. Our next stop is the National Art and Decoration Museum, which has a huge section on Fashion. Unfortunately – we’re going so slowly that we arrive with under an hour before it closes. We zip quickly into the Regency section – I snap a picture of dancing shoes – I hear tell of an amazing ball being held in Brussels in just a few weeks – I really could use some new shoes. Just across the mall from the Art and Decor Museum is the ‘Old Master’s’ Museum of Berlin. And it is a stunner. And open an hour longer than the Art and Decor Museum. So we zip in there – and hit the highlights. 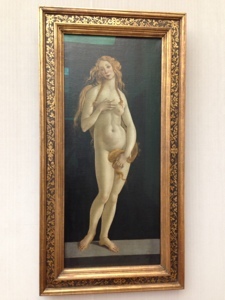 I’m a huge fan of their Venus – and there are some Rembrants and Rubens that you just don’t want to miss. We also spend a good 15 minutes enjoying the Proverb painting by Brueghel the younger. So good. And they also have a Hermonious Boch. Sigh. Dinner is at the Tex-Mex (yes – again) – this time we are meeting up with a friend from Montreal – and it’s the one place I know for sure is good, not expensive – and I can find! 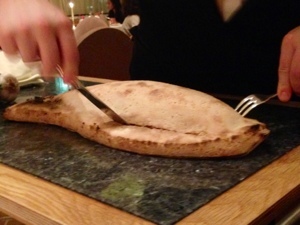 Dinner is great – The Intrepid Traveller and I split a single meal – the portions are that big. Home – Bed – early up for our flight to St. Petersburg, which goes swimmingly. No problems – even though we’re flying Areoflot – and I admit to a bit of concern about using a Russian Airlines. Turns out I should not have been worried. We are standing at Baggage Claim when my female friend from Africa – Mr. Piatgorsky – sneaks up behind us to give us a hug, and a high 5 welcome to St. Petes! Why Mr. Piatgorsky? Turns out she’s travelling with a huge – really huge – suitcase. And Mr. Piatgorsky loved to travel with his cello – to the point where he’d buy the seat on the airplane next to him for his cello. Needing a name for the reservation – and not being married – he would reserve his seat for Mrs. Piatgorsky! I’m going to call her MP for short! Anyway – we’d planned to met up – MP is spending 10 days with the IT and myself in St. Petes. We’ve already made our reserations at the MIR youth hostel – 1 private room with bath for the IT and myself to share – MP is getting 2 beds – one for herself, one for her suitcase. But you will have to wait till tomorrow to hear how things go down in St. Petes! Signing off – The Soup Lady – and her travel buddies – The Intrepid Traveller and Mr. Piatgorsky! Palaces of Tears, of Queens, and of Famous Paintings – ah, it must be Berlin! 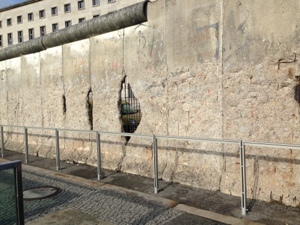 Day 3 in Berlin dawns bright and cold – given our plans for the day – more museum visits – it’s perfect. Our first stop is a brand new ‘museum’ – called the Palace of Tears. It’s located right behind the Main Train Station in Berlin – and it served as the ‘Border Station’ during the days of the iron curtain. It has been carefully restored to look just like it did during the Cold War – where it was the main crossing station between East and West. Thru a combination of interactive exhibits, free audio guide, multi-media displays, and written text – the conditions facing people who wanted to travel between East and West were explained. At the end of the exhibit – there’s a brief section on the events leading up to the falling of the wall – and I will admit to leaving the museum with tears in my eyes. Very very moving. We now head for one of the two major palaces open to the public – Most go to Potsdam to see San Souci – but not us! Nope – we’re going to see the Sophie-Charlotte Palace (aka Charlottenburg Palace). It’s a bit closer to Berlin – and reportedly has far fewer crowds. And is just as big. We figure if we can do it quickly – we’ll try for Potsdam too – but that is a pipe dream. The trip to the Sophie Charlotte (aka Charlottenburg Palace) is fast and easy – I admit to a love affair with the Berlin Metro. So well signed – every station has elevators and lifts – and the stations, the stair cases – even most of the elevators are wonderfully clean. Most importantly are the multiude of pre-warning signs. As you leave a line heading for the next line at a transfer station – there’s a sign telling you when the next train at that future line will be leaving in each direction. Consider how handy that is – you know before you start the hike whether or not to rush. Cool. Anyway – the Sophie Charlotte Schloss is huge. And it was totally ruined during the war. The roof was gone, the insides essentially gutted. And it has been completely rebuilt. Most of the moveable interior funishing and paintings were safely stored during the war – so those are the originals, it’s the incredible flourishes and swirls on the ceilings, and the glorious wall paper (not to mention the walls, floors and ceilings) that are ‘new’. Fortunately, the Sophie Charlotte had been well photographed prior to the war – it was already a museum – so there was lots to work with for the restorers. And the results are wonderful. There are 2 huge sections to the building, the older more intimate section that was built before she became Queen, the wing that was added by her grand-son – Alexander the Great, and of course the magnificent garden. Most beautiful room – the ball room with it’s high ceiling, green paint carefully chosen to make the dancers feel they were dancing in a garden – and in their day – mirrored windows so as you danced, you could see the reflections of other dancers. The impact is amazing. There were 2 paintings that particularly caught my eye. One I’ve seen copies of many times – Napoleon on his horse crossing the Alps by David. As per Wikipedia – source of all knowledge – The version produced for the Château de Saint-Cloud from 1801 was removed in 1814 by the Prussian soldiers under von Blücher who offered it to the King of Prussia. It is now held in the Charlottenburg Palace in Berlin. So this time I was seeing one of the 5 existing originals. But even more intriguing – in the next room is a strikingly similar painting of Blucher – also on a rearing horse. According to the audio guide – Blucher – fresh from the win at Waterloo – commissioned an artist to create a painting of him that mirrored that famous one of Napoleon – and for many years – the two paintings hung side by side. Today they are in seperate rooms – but easily close enough to be admired one after the other. Also in the room with David’s Napoleon is one of the famous one’s of Napoleon as Emperor – clearly also spoils of war! Another fascinating fact – when Napoleon conquered Berlin – he slept in Queen Luise’s bedroom in the new wing – which has been redone to look as it looked when he was there. When she returned to power – she refused to sleep in that room – so her darling husband – the King – created a new bedroom for her – closer to his own. Nice, huh? After walking our feet off at Charlottenburg Palace – we checked out the three other famous museums that are clustered at the entrance – the Berggruen Museum, The Collection Scharf-Gertenburg, and the Brohan Museum. We carefully tour all 3. My clear favorite was the Berggruen – color me pink, but any museum with 85 Picasso’s is going to make me happy. I loved it. The Brohan Museum was much smaller – and featured a lovely collection of Art Deco objects. I would happily take any of the tea sets if you want to get me a birthday gift. The Scharf-Gertenburg was much more difficult to appreciate. It’s collection of works by Surrealists like Max Ernst and friends is interesting – but hardly joyous. Most intriguing to me were the series of etchings on a Lady’s Glove – and the glorious Egyptian Arch that just happens to share space in the Museum. Overall, however, I ended the visit feeling sorry for artists that suffered so much for their passion. Clearly 6 museums in one day – at our speed of travel – is a challenge. To describe us as exahusted would be an understatement. We slowly dragged our bodies back into rush hour on the Berlin metro, made our way back to our hostel – and while Jill rested up (and set up plates and silverware for dinner) – I bravely went out to hunt down food. The Cat’s Pajama’s Hostel is located in a funky area of Berlin – lots of inexpensive options – including the omni-present Doner establishments. I spot one that not only has a Donner machine – it has a chicken rotisserie – and there are 3 chickens on the spit. I order one (wait 10 minutes please), find a bottle of Spanish red wine for 2.5 Euros, and hunt down some pastries. Back to my chicken restaurant – for my chicken and a huge salad. We feast well tonight! We are joined for conversation by a young Australian, our quiet but passionate male Argentine friend, and the young Pole who was defending Democracy against the Russian the night before. Tonight our conversation is mostly about walking tours – they had all taken different ones and were comparing notes. Tired, full, happy – we tottle off ‘early’ at around 10:30 for bed. Signing off – The Soup Lady and the Intrepid Traveller. The Pergamon, the DDR, and the Jewish Museum – Such a busy day! We opt for an early start – grab breakfast at the Cat’s Pajama’s and head out for the Pergamon Museum. Even though we know that the name sake exhibit – the Pergamon Altar – is closed for re-hab until 2018 or so – there are still stellar things to see at this museum – most notably the gates to Ninavah – or Babalyon – depending on your reading text. Guide books and fellow travellers have warned us about long – long – long lines – so an early start is pretty key. We end up arriving just 10 minutes before opening time – and the line is very short. We didn’t opt to buy tickets on line – we have student passes to present – and since they will get us a 50% reduction – we’re keen to use them. Note to other traveller’s – we bought the 50 Museum pass option – for 12 Euros. It’s good for all the Museums on Museum Island – plus 45 other Museums scattered across Berlin – including our 3rd stop of the day – the Jewish Museum. We’ll pay it back in savings by tonight. So – after waiting in line, buying tickets, doing the mandatory leaving of the backpacks in the locker routine – at about 10:45 we’re finally standing awestruck in front of the gates. These are the smaller gates – the larger ones being too big for the museum to display – and still they are massive. They tower over the crowd – and while we are hardly the visitors of yore – and there is nary a camel to be seen – it’s easy to imagine walking across the hot sands – seeing these gates raising like a mirage in the distance. Incredible. There are several other highlights in the museum – an intact market gate from an ancient town in present day Turkey, a guest room from a house near Mecca, and parts of the wall surrounding a palace. Massive pieces of art – carefully dug in pieces out of the ground, shipped to Berlin to be lovingly put back together in rooms dedicated to their display. The Pergamon well deserves it’s reputation as a place not to miss. From the Pergamon we walk slowly back past the Berlin Dom to the DDR museum. This tiny independantly run museum was one of the highlights of my last trip to Berlin – and it didn’t disappoint this time. Hours later we surface – having learned a ton about what life was like in East Germany – what clothes people wore, what rules they had to follow to get ahead – and just a tiny bit about how hard it was to leave. We make our way back to the Metro – and from there we go to the last museum of the day – the Jewish Museum. We arrive there at 4:30 – thinking we have tons of time since the museum closes at 8:00. Wrong. So Wrong. This Museum recently added a new wing – twice the size of the original museum – and the architect created a space that is entirely unique in the world. You know you are in for a visual treat from the moment you see the Museum. There’s the Baroque original (If it’s not Baroque – don’t fix it), and seemingly completely separate is this massive steel structure that appears to have slashes across it’s face – as if it were attacked by a giant beast. This is the new wing – from above it looks like a lightening stroke, from the ground it looks and feels tortured. Stunning. You enter the museum just as you would any other – thru the Baroque section. But after you get your ticket and do the mandatory stowing of the back-pack – things change. You are directed to start off by descending a long, fairly dark staircase and find yourself at the bottom in a space with 3 distinct paths – the Axis of Continuity, the Axis of Exile, and the Axis of the Holocaust. The Axis of the Holocaust is a dead end of course. The Axis of Exile ends in the Garden of Exile – another masterpiece of architectual design. Walking in this space makes you dizzy and dis-oriented – exactly the feeling that the designer intended – since that is how many refuges feel when they arrive in a new land where they know no-one, don’t speak the language – and must survive. Following the third axis takes you to another seemingly endless staircase up leading to the start of the main exhibit. The theme of the exhibit is Jewish life in Germany in the last 2000 years – and it starts of course in Isreal with the disaspora. The exhibits follow the experiences of the Jews – thru the inquisition, the Black Death, the good times of acceptance, the bad times of rejection. It is fascinating – and big. We are just at the 1/2 way point when they close the museum around us – offering us tickets to come back the next day. We are stunned. Where did the time go? But they are closing – and so we head home for left over Fried Chicken, involved and detailed conversations with our fellow hostel guests – including a rather serious for the circumstances lecture on the future of socialism from an intense young Russian. Exhausted but pleased – we head up stairs for bed. Signing off too tired to think… The Soup Lady and the Intrepid Traveler. Whit Monday is a holiday in Berlin – Another surprise! All the stores are closed – as are the banks, the post office, most offices – and I’m guessing government buildings. Good news for the tourists – at least most restaurants are open – and museums normally open on Monday are open today too. 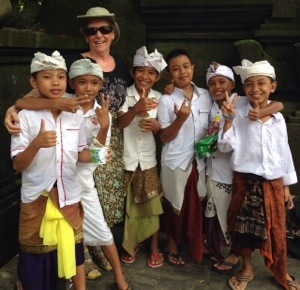 Whew – for a minute I thought I was back in Bali celebrating Nyepi – only with less preperation! We’d planned to do the Berlin Basics today – Check-point Charlie and the Topography of Terror Exhibit being first and foremost on our list. Check-point Charlie is silly – 2 guys dressed up as soliders – posing with any tourist willing to tip them. I guess the good news is they are being nice about it – smiling or being serious as the tourist requests. But it’s really silly stuff. 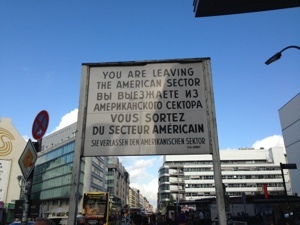 More interesting – and well worth reading – are all the official signs talking about where the wall was – and tracing the route down Zimmerstrasse thru the carefully placed cobble stones. We walk the Wall to the Topography of Terror – a free exhibit that traces the history of Hilter and the SS from 1933 till the end of the war. Stunning, informative, horrifying, intriging, alarming – and unforgetable. The mood in the large space is somber – as befits the topic – and the timeline starts off like Hilter did – slow and careful – picking up speed and horror as time moved on. A must see exhibit. We leave there to check out the Gropius House – but the special exhibits on this month don’t appeal to us. Next stop – a quick peak into Potsdammer Plaza – and then a stroll towards Brandenburg Gate. A wildly unique building attracts our eyes – that plus a sign that says free Science Museum. Even better – it’s open. So we stroll on in. It’s a display put together by Otto Bock Inc. – famous for prosthetics. And it’s all about the human body and how our brain controls our legs and hands. It’s fascinating. I particularly found the beam walk simulaton intriguing. It’s really easy to walk a beam that appears to be flat on the ground – another story altogether to walk that beam when the visual tells you that you are high above a city scape. 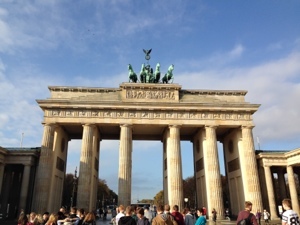 Walking on – we admire the Brandenburg gate – and the crowds of tourists admiring the gate. Been there – seen it. We move on. Our next stop is a fabulous mini art museum – The Guggeneim – Deuche Bank Museum. It’s a modern art exhibit space – free on Monday’s – that this time is featuring an artist who asks questions and then attempts to get the audience involved in his answers via video footage. One stunner – he goes to a flea market and displays a collection of palm tree branches for sale. Full sized palm tree fronds. Eventually – after a lot of curious looks from the passers by – the organizers ask him nicely to leave. Granted the palm tree branches are used – but hardly the stuff of yard sales. He morfs this experience into a discussion on group definitions. What is – and What isn’t – a flea market appropriate item. Another challenge has 5 people trying to play one piano at the same time. In another video – 4 potters try to make a single pot together – with strange results. I’m not going to describe the rest of his work – but you get the idea. Challenging questions – with probably no really good answers. Moving on – we opt to collapse into “The Digital Eatery”, which kindly gives us hot water for free to go with our slice of cake. They have a virtual reality simulator – which of course I must try! The first program is a jet fighter in outerspace – Once I put on the glasses – I can see my body wearing a space suit, my arms manipulating the controls of the space ship – and of course my surroundings – a meteor shower with targets to hit. I loved it – even if I couldn’t actually hit any of the targets – in fact – I never even found them! But it was still very very cool. 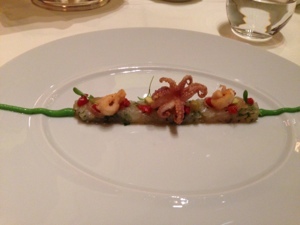 We continue our walk – ending the day at the Haut Banholf – and eat a surprising great dinner at the Tex-Mex Cantina. 6.90 Euro (about $8 Canadian) for a fried chicken dinner large enough to feed 2. But we didn’t know that – so I ordered Pork Chops – same price – same huge size. Well – it’s going to be left overs for dinner tomorrow. We drag out tired bodies back to the metro and head home to the Cat’s Pajama’s. Tea, Blog and Bed for Bozo…. Travel is one way to discover who you are when you are not at home! This time the Intrepid Traveller and I are doing a city tour. For those who have faithfully followed our adventures around the world – you will know that this is a tad unusual. Generally we are more ‘country’ centric – rather than ‘city’ centric. But I can easily explain the difference. Reason for city tour #1 – we’re getting older. I hate to admit it – but it’s much harder to visit a country than a city. More short stays are hard on old backs and tired knees. Reason for city tour #2 – we really, really wanted to see one city in particular – St. Petersburg. I know tons of people who’ve been there – and I’ve never heard one of them say – we stayed too long in St. Petersburg. So we figure – 2 weeks is just about a minimum for a city that large, that unique, that different! We shall see of course. Reason for city tour #3 – I will never be the only driver of a rental car again. Never. I’m a bus, metro, train kinda gal – renting cars with the expense and responsibility involved – nope. So moving between cities is going to be public transit – and in this case – plane! So – our city tour is centered on 4 cities. City #1 – Roissey en France. Yes – lowly little Roissey – hard by the Charles De Gaul Airport, and primarily known for it’s zillions of cheap bedrooms for tourists in transit – it’s our first stop. Ok – it’s really a transit city for us too – but we’re taking a full day to explore it before we move on. City #2 – Berlin. Ah – the sausages – the pretzels – the beer. Well – since the Intrepid Traveller doesn’t ‘do’ beer – perhaps we’ll have to work around that highlight. And of course the Berlin Wall. Our real reason for including Berlin this time – it was on the Intrepid Traveller’s Hit List – and who am I to not want to fulfill her wishes? City #3 – St. Petersburg. The point of the trip – the highlight, the raison d’etre. 2 weeks here to savor the sights, visit the museums, and go to the Theatre. City #4 – Brussels. Why Brussels – well, we needed a city that Air Transact flew from non-stop in order to get the Intrepid Traveller back to Montreal. And we needed a city worth visiting, and we really didn’t want Paris. Option – Brussels. Besides – I hear Napoleon might be massing his troups to the south – who am I to avoid good battle? So that’s the plan – let’s see how it all plays out. Signing out to fly to Roissey en France (aka Charles De Gaul Airport) – The Soup Lady and the Intrepid Traveller. I’m been thinking a lot about different ways to travel – and I have some suggestions on how to make your travel experiences different (if you want it that way) – so head’s up These suggestions are coming your way. Suggestion #1 – Pick an interesting place to go! In other words – Get out of your comfort zone. I once attended a lecture on Eco-Travel – and the speaker suggested that there are 3 ways to travel – The Accidental Tourist, The Eco-Traveler, and The Adventure Traveler. To his mind – the Accidental Tourist wants home in some other place. Same pillows, same bed, same AC, same food – just a different local. Not my way of travelling of course, but I admit to a touch of envy of those to whom this method works. It’s so easy! Cruise Ships are the ideal for this of course – one room that is yours for the entire trip, a different place to quickly check out each day – but no fear. Nothing really surprising is going to happen – well, maybe the restaurant on board you want that night is booked – but nothing truly annoying. The Adventure traveller is also not quite ‘me’ anymore. I’m too old to take serious chances – I’m not going to climb Everest, I’m not likely to want to kayak up the Amazon, and I’m certainly not going to sleep on the ground if I can help it. Nope – I draw the line at not having my own toilet. The days of climbing ladders in the middle of the night to go to the oh so public bathroom are behind me – I’m a fan of ending the day in a place I can call my own. But again – I envy those who are willing and able to do serious adventure travel – 24 hours on a train in 3rd class sounded like a lot of fun when I was 55 – but it’s not going to work now that I’m 66. Nope – train travel, while huge fun, is no longer on my bucket list. Which of course leaves the 3rd option – Eco-Travel. Going off the beaten route a bit – for longer – but not crazy. I chatted yesterday with a gal who hated Bali. She had taken a cruise ship that included Bali – and spent 5 hours on the island. Long enough to find out that the main city is just a big main city – and not nearly enough time to experience any of the magnificent culture, see any of the real rain forest (it’s about 4 hours inland from the port – trust me – she didn’t get there), nor even enough time to decently visit a museum or eat a good meal. 5 hours on an island isn’t even enough time to walk past the touristy shops that clog the area near the port. I don’t blame her for not loving Bali – but I do think she should have realized that the issue isn’t Bali – it’s the result of being an Accidental Tourist! Ok – so where to go, and how long to stay. The 2nd question is the easiest to answer – as long as possible of course. But I’m guessing like me, my readers have lives outside of travel – and there’s a limit to what you can and can not do. So my suggestion – a week is a bare minimum. If there’s a guide-book to your destination that’s thicker than a 1/2″ – you are going to need a week. If the guide-book runs over an inch in thickness – 2 to 3 weeks is a much better plan. The guide-book for Bali was about 3/4 of an inch thick – but the culture was so unique and wonderful that 3 weeks was really cutting it short. So – optimum – 1 week to 3 weeks if work schedule allows. Per city. Not per trip. Don’t try to see a city in a day. Impossible to meet anyone in under a day – isn’t going to happen. And it’s meeting people who live where you are the tourist that makes fun stuff happen! Now – as to the where… Ah – the Where. My next trip is to 3 cities – none of which are on the ‘unusual’ list – but all 3 of which offer tons of things to see and to do. I’m going to Berlin for a week, St. Petersburg, Russia for 3 weeks, and then Brussels for a week. Not as adventuresome as Bali perhaps – but giving these 3 cities enough time will, I hope, result in interesting experiences. That’s a lot of history to explore in just one day – but in Berlin, it’s not that hard to quickly cover at least most of the major sites for history that I for one clearly remember. I was born in 1948 – three years after the allies split up Berlin, and just one year after the “Cold War” started. So I was always aware that there were 2 Berlins – an East and a West. I was too young to remember the Berlin Airlift of course – but I was traveling in this part of Europe in 1969 – and the ‘Iron Curtain’ was of course very real to me. I crossed over in Czechoslovakia, had to exchange a specific amount of money at the ‘legal’ rate for every day I would be behind the curtain, and experienced for myself the very real, very popular, black market in currency. In those days $1 US would buy you enough money to live very nicely for a day. So a huge reason for me to even be in Berlin was the opportunity to see for myself places I’d only read about. We started the day by walking to the Brandenburg Gate. For my husband, the fact that Napoleon entered Berlin through this gate was of prime importance. For me it was the memory of Ronald Regan challenging Gorbachev to open this gate that made my seeing the gate so impressive. 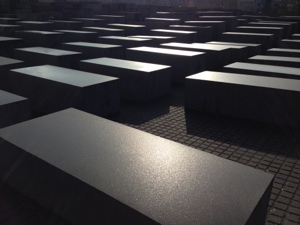 After the gate – which is, in the end, only a gate – we walked the Holocaust Memorial. The 2711 concrete blocks evoke a feeling of both mystery and intense sadness. You can walk the maze considering the fate of so many people killed in the name of baseless hatred – or you can do what so many young people were doing – using the blocks to play hide and seek. We skipped the information center – we have our own personal history to remember. 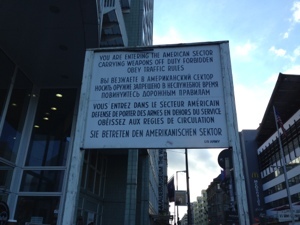 From the memorial – we walked to Checkpoint Charlie. For me – this was another must see site. The free outdoor exhibit was both informative and interesting. I do not remember how large that Checkpoint had become before the Berlin Wall came crashing down in 1989. At the peak – it was at least 10 lanes wide. It was particularly chilling to read the accounts of each of the known successful – and un-successful attempts to get over the wall – the last one of which happened just 2 months before the wall fell. At Checkpoint Charlie – they direct you 500 meters North to the last remaining section of the wall still standing – kept in respect at the “Topographie des Terrors” – an absolutely must see and read and remember account of what happened in Germany from 1933 (the year Hitler became Chancellor) to 1945 (the end of the war). Using photographs taken by members of the Gestapo and multitudes of original documents, including most chillingly – instructions from Berlin to Cologne on how to behaving during ‘Crystal Night’. The increasingly rapid decent from reasonable to rabid is traced in detail in both German and English. A must see display. A chilling way to spend most of a day – but well worth it. After a late lunch, we opted to spend the rest of the day doing something a little more upbeat – so we walked to the Gemaldegalerie. This is Berlin’s Grand Survey of Old Masters – and it is awesome. We only managed to hit the highlights – but what highlights they were! Caravaggio’s Amor Victorius, Pieter Bruegel the Elder’s Dutch Proverbs, a room full of Rembrandt’s – including the famous helmeted man – a painting no longer attributed to the master. All perfectly displayed, and excellent described in the audio guide. 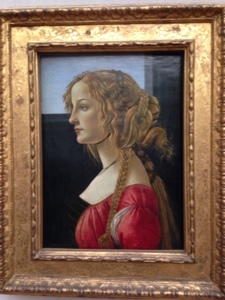 But my top favorites were the Botticelli’s – interestingly enough NOT described in the Lonely Planet guide we’ve been using – but of course described in loving detail in the free with admission Audio Guide. Speaking of Admission – we invested in the Museum Pass – which listed this museum as ‘included’. And the permanent exhibition was included. Unfortunately – the special exhibit on Picasso was not included, so we opted to save money and energy – and not go. But it is annoying to have a pass that covers some but not all. Oh well – I guess museums must make money somehow. We ended the day by trying to see Neue Nationalgalarie – modern art housed in a building designed by Miles van de Robe. Unfortunately – that’s all we go to see – the building. The permanent collection is undergoing refurbishment, and the Museum Pass doesn’t cover the Special Exhibit. Neat building though. 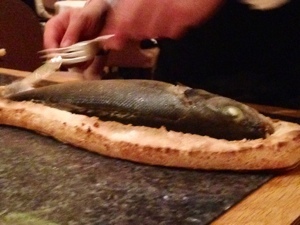 Bottom line – a very interesting, albeit long, day in Berlin.